Six Penn Manor High School students recently received their FFA Keystone Degrees during a ceremony at the Pennsylvania Farm Show. Kate Campion, daughter of Anne and Mike Campion of Lancaster. Stephanie Dengler, daughter of Jodie Dengler of Willow Street. Logan Pickle, son of Jeff and Mary Pickle of Conestoga. Cody Martin, son of Kevin and Chris Martin of Lancaster. Wayne Rineer, son of Barry and Carol Rineer of Holtwood. Shyanne Murray, daughter of Jane Way of Lancaster. Congratulations, students, on earning this distinguished honor. 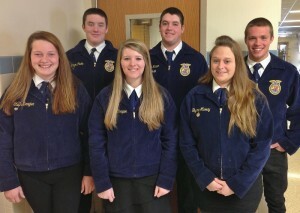 Manor FFA members who recently earned Keystone Degrees are, from left, Steph Dengler, Logan Pickle, Katelyn Campion, Wayne Rineer, Shyanne Murray, and Cody Martin.